In regular piping, steam carries large quantities of entrained material. With TLV's Separator Filter, improve heating efficiency and product quality by removing condensate, dirt and scale. A built-in cyclone separator (98% separation ratio) eliminates condensate, dirt and scale before filtering. This extends the filter maintenance cycle. 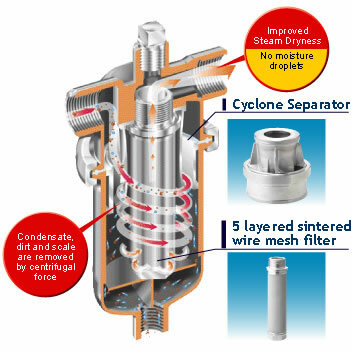 Compared to a filter without a built-in cyclone separator, the time between required maintenance is improved nearly three times. An easy to clean 5-layer sintered wire mesh filter that maintains an extremely low pressure drop for extended periods. A ferrule joint clamp facilitates easy cleaning.